A professional grower always knows that every plant needs the right environmental condition for the best output. As one of the cannabis cultivators, I have also realized this fact. Cannabis needs comfortable temperature, and it should not be too much humid or too hot. For all indoor and outdoor growers, a change in the temperature or humidity level is one of the major concerns. Considering my own experience, I can say that the temperature level must range from 70 to 85 F during daytime, while all the lights remain activated. But, this temperature is good, while the plant is in vegetative stage. If the plants have started flowering, there is a need of lower temperature. When you have only the seedlings, humidity percentage must range from 65 to 70. As their roots have been matured, this percentage should be high. For the late flowering condition, the percentage has to be between 30 and 40. The temperature level must be 18 to 24 °C. I think a good knowledge on these conditions is essential for increasing the growth of cannabis. Lower temperature level can hold back the growth of cannabis. Temperature level, below 60°F, will cause a negative effect on the growth, and in many cases, it may kill your plant. Remember that cannabis plants may have mold invasion, and so, controlling the temperature is the only way for surviving the plants. Though the hotter temperature may not kill plants, it can affect the growth rate. The temperature level, which is more than 80F slows down the development of buds. You may also find reduced potency of those buds, and, it can affect your profit as a cannabis grower. Humidity and Temperatures – How Do They Have Interaction? Does Your Device Have Data Logging System? One of the important facts to every grower is that the temperature condition and humidity percentage has a close relation to each other. While speaking about moisture or humidity, I have to mention the relation of maximum and partial water vapor pressure ratio. In fact, it is the RH that is essential for growing cannabis plant. Hot air has the capacity of holding more amount of water vapor. That is why extraction of this air is essential for the indoor cannabis cultivation. It is better if the cold air access the room. So, temperature and humidity- these are two factors to be considered for cultivating cannabis. To observe both these conditions, I have decided to buy special tools. 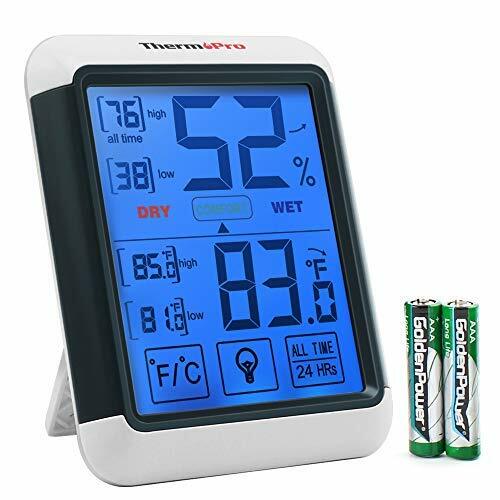 I have seen that many cannabis growers buy hygrometer and thermometer separately. They use the hygrometer to measure the humidity level, while the thermometer is useful to know the temperature condition. But, do you like to have a better deal for growing cannabis. A hygro-thermometer is the best device that works as a temperature and humidity controller. With this unit, as I am able to read temperature and humidity, it gives me more convenience. Just as any other device, you may find the difference in mechanism of hygro-thermometer. While you consider the way how it works, you will get two different categories- mechanical and digital unit. In case of a mechanical unit, you need to use the dial screen for reporting the measurements or results. The best fact about this device is that this unit is much reliable and reliable. I have also tried it out to measure the temperature and humidity percentage. Most of these meters are available at a lower price. However, they are good at their performance. Another option, which is much popular to lots of growers, is the digital hygro-thermometer. It has given me an instant output that is easily comprehensible. I think that using a digital unit for controlling environment is really a fun. It is also easy to use this type of unit and the beginners also like to buy such device. The wireless systems are also good for measuring the humidity and temperature. No one likes to deal with the tangled cables of unit. So, the Wi-Fi enabled devices are the best solution to this problem. Almost all hygro-thermometers have LCD screen to display the information. I have checked out its mode of operation and the presence of backlight. This light helps me to see the data at night. The hygro-thermometer helps in the measurement of humidity level or moisture percentage in air. As we cannot measure it visually, there is a need of using this tool. The device is able to make the level of water vapor with the help of a special system. It can assist you in assessing humidity percentage, ranging from zero to hundred. However, in few cases, the measurement limit may be lower than eighty five percent. I have checked out this feature while buy any hygro-thermometer. Just as humidity percentage, temperature level is another important factor to every buyer. 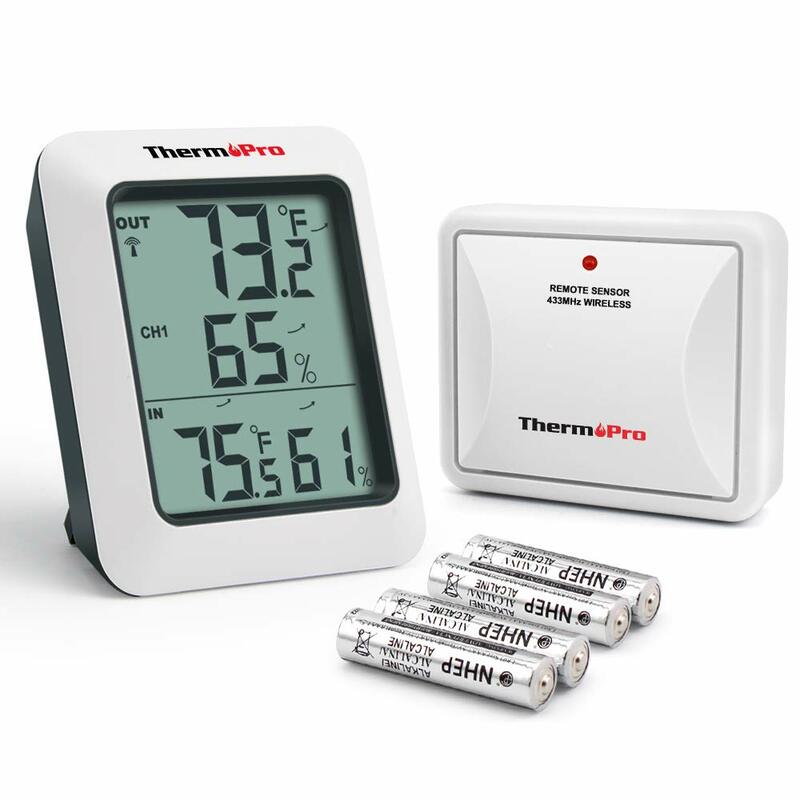 The design thermo hygrometers may be different, and these models are able to measure various temperature ranges. I consider it as an important aspect to grow cannabis at the fastest rate. In most of the modern hygro-thermometers, data logging system plays an important role. It is such a feature, which improves the versatility of the unit. This also assists in measuring the humidity or temperature with various methods. I have chosen a unit, which has the capability of recording all its readings in the storage unit. Data storage in SD card is one of the good ideas for the cannabis growers. With the higher-quality units, you will also be able to transfer your data or records to your PC. There is no need of any software system. The readings are also downloadable to computer with the use of USB. Thus, for ambient environmental conditions for cannabis plants, hygro-thermometers need to have these features. It is another feature, which helps users in having a record of humidity percentage and temperature. While using this feature, I have found that the unit displays highest and lowest readings. As both these levels are essential to cannabis growers, I love this type of feature. It is the most important thing to me. If the readings are not accurate, there is no value of the device to me. Whether it is humidity or temperature level, it must be correct. While there is a variation in temperature, it may affect the cannabis growth. The digital systems are effective in accommodating various inputs. The auto-tuning capability, fitted to most of the models, also helps in presenting the best results to show temperature and humidity. So, while I have bought any hygro-thermometer, I like to ensure that it offers the best level of accuracy. It is the saturation point of water and air, and I need to measure it with the help of hygro-thermometer. At a particular temperature level and air pressure, the water vapor gets condensed to make the formation of liquid. In order to analyze it, hygro-thermometer has special system, which gives responses. Source of power is one of the important concerns, while buying any type of device, include hygro-thermometer. The older units are only electrically operated. However, the modern devices give an opportunity of using the battery. I have chosen the products, which offer both these options. While there is no electric power, the battery is the right option. I like to record data at the set interval. It gives me an option of customization while tracking the data. I can find the change of humidity or temperature at any time that is much convenient to me. While buying the unit, I also need to make out whether I should spot check or observe the conditions constantly. These are also major features of hygro-thermometers. I love the portable one that I can carry to any place. I may take the reading anytime. In case of durability, the outdoor units are the sturdiest ones, and they are able to endure any condition. With the term hygro-thermometer, most of us think that it is capable of measuring only temperature and humidity. However, there are advanced units, which reveal more information to you. I have bought a device, which gives data on rainfall, wind speed, its direction and other details. As all the elements of weather have an effect on plant growth, I think that it is better to choose this type of unit. Many of the units are wall-mounted, while for others, there is a stand, attached to the system. The choice depends on how I like to use the device or where I install it for controlling the growth of cannabis. I have bought this device as my first thermometer humidity monitor. Though it was much small in size, it has helped me much for growing cannabis. The best fact is that I can use it not only in the outdoor space but also in the indoor site. So, I can know the temperature and humidity level of any area by using this simple device. With ThermoPro TP60, I have made an affordable deal. The screen for display is also clear, and it reveals the accurate readings. Another good thing about the device is that it may show the interpretation from three outdoor sensors, which work remotely. For cannabis growth, it is one of the most recommended tools. However, for indoor users also, there is no chance of facing any risk. With the right level of humidity, controlled in the room, you may have significant benefits to your health. The system may be installed in the basement, greenhouse, nursery, cellar and other rooms. You can fit the unit on the wall or place it on the tabletop. I have no hassle in using the thermometer as it is a wireless unit. As it has no cord, there is no risk of getting tangled. I have used AAA batteries to run the system. 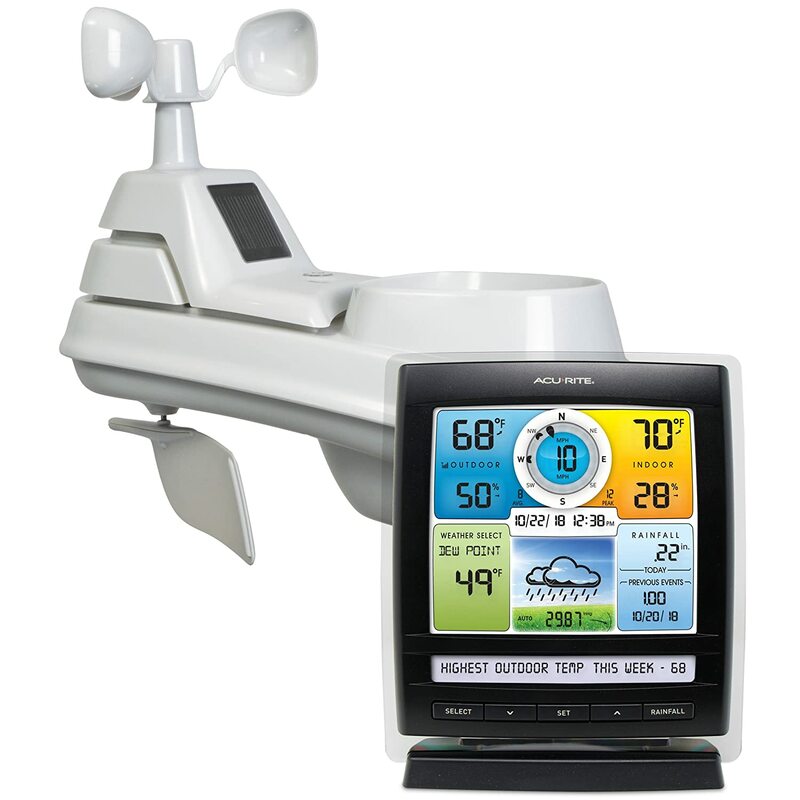 With simple design, the unit monitors the weather condition of various locations. For displaying temperature, the system reveals you the result in both Centigrade and Fahrenheit degree. Though I am a new user, I have read the device with no trouble. The temperature condition is indicated with arrows. I can make out if it is cooler or warmer near sensor. The remote range for calculating the humidity is about 200ft/60m. Throughout the twenty-four hours, I can track the humidity and temperature. Resetting the system is also easy with this humidity and temperature controller. This is another digital unit that I have chosen as a cannabis grower. I always look for a device that gives accurate readings, and this hygrometer-thermometer has met my needs. Though I have bought it as an outdoor unit, I may also use it for my rooms. To avoid allergens or skin issue, I like to keep up the right humidity percentage and temperature. Now, let me tell about the touchscreen of this device. It is an LCD screen with 4” in size, and I think that this display can clearly reveal the readings. The presence of backlight has helped me to read the screen at night or in dim light condition. Automatic deactivation of the light after fifteen seconds saves my battery power. As a passionate cannabis grower, I have to get engaged in my profession all the time. That’s why I like to choose a temperature or humidity controller, which works well during day or nighttime. The ease of using the device has also pleased me. While I need to change the settings, I can accomplish it without uninstalling the system. It has reduced my everyday effort. However, mounting the device is also easy. It is magnet and wall mountable or may be placed simply on a table. Temperature or humidity measuring capacity is also good for this unit. It displays both highest and lowest level of humidity and temperature. There are icons for indicating the humidity percentage. I can make out whether the air is wet or dry. As the system reveals the present trend for every reading, I can take action at the right time. It helps me to adjust the humidifier or thermostat to have the best output. As a tech-savvy person, I always like to go wireless. For cannabis growing also, I prefer this type of device. 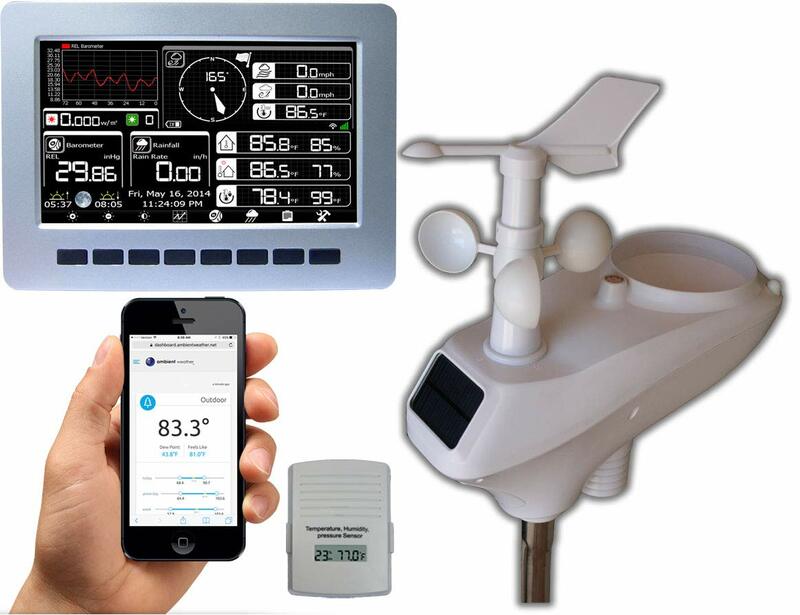 This weather station is full of useful features, and I have got it at a reasonable price rate. To say about its design and other unique features, I like to mention the self-setting system. The colorful icons have also helped me to use the system easily. Just as many other units, it enables the connection of three sensors. The screen displays six different types of weather. The vertical design looks well, and I am satisfied with the way how this unit displays the result. It is really an attractive model and I can consider it as a comprehensible unit as it not only reveals the temperature and humidity but also the barometric pressure. The temperature measurement unit can also be changed to Fahrenheit or Celsius. 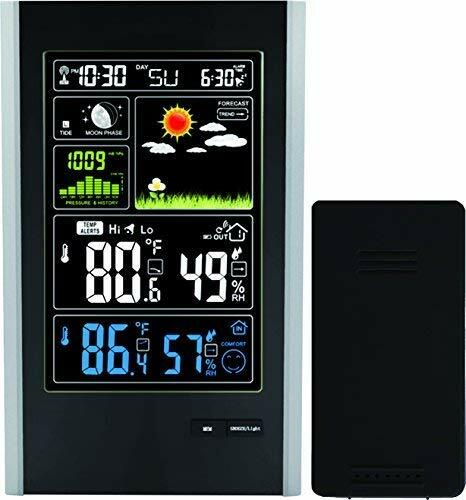 The indoor temperature range with this thermometer varies from 0 to 50 C, while for outdoor, it is between -20 and 60 C.
Temperature alarming system is adjustable, and I love its programmable system. Just as we find in our mobiles, this alarm is also equipped with a snooze option. The clock, attached with this weather station, also works well, and I need to use batteries for powering it. However, I can plug in the base for operating the unit. The USB port, included in the package, is useful, and it helps me in charging other gadgets. Overall, I have got almost all the helpful features with this package, and I like to use it for cultivating cannabis and other plants. I always try to get more with less investment, and this 5-in-1 system has helped me to meet my needs. With one simple design, I can make out the present humidity level, rainfall, temperature and the speed and direction of wind. This device helps to me to track not only the daily rainfall but also to record the monthly and yearly ones. There is a special weather ticker system, and it reveals instant data on everything about temperature, moon phases and many other things. The process of installing or setting up the unit is also easy. The illuminated screen has also an innovative look. It includes dimmer with adjustable feature for convenience. At any time, you can read all the results without any hassle. There are various settings for lighting, and I can adjust it manually. However, the brightness also gets adjusted automatically. In case of wind, the speed range may be maximum 99 MPH, and while you like to direction, you may find two previous details. The source of power has options as I may get it from battery or electricity. Moreover, the self-calibration technology, used in the device, has made this product much innovative. The manufacturer has applied a special algorithm for analyzing the temperature or pressure change. I have got much facility from this product, and I like to recommend it for other cannabis growers. I have selected this tool as another temperature and humidity monitoring system for cannabis growth. This Wi-Fi enabled device has given me a good value due to its simple installation technology and reliability. But, another thing, which has amazed me, is that all these things are available at a reasonable price. This unit has really made my tasks easier as the display system receives and transmits data through the Wi-Fi connection. The detailed information on the weather conditions has helped me to increase the growth of cannabis. With this unit, I can get the records of rainfall and dew point. The graphical representation of temperature, humidity and barometer is easy to understand. The display of maximum and minimum conditions is also important, and the inclusion of date or time presents me a thorough report. The alarm system is clearly audible, and it gives me warning on both low and high condition. The device shows the measurements metric and imperial. So, I have faced no problem in reading the information. This product is technologically more advanced than others. It has helped me in exporting data to my SD Card. Thus, for updating firmware, this card is much useful. IFTTT feature is another notable thing that I have found with this unit. I have connected IFTTT to the web services and sensors for controlling other systems, like switches or light. Wunderground connection is also advantageous as it has helped me in viewing, sharing, storing, analyzing and comparing the information. The desktop-like display is much slim and attractive. I can control its brightness with the adjustment of settings, considering the daytime. So, buy the best humidity and temperature controller to grow cannabis. I have picked only those products that I have already tested. I think that these products will also give you all the benefits for cannabis growth.